Panda has been on his quest to find home for some weeks now, so if you need to catch up, you can start with chapter one. As I write this, I have just finished taking the pictures for Panda’s final adventure. I was honestly a little sad as I took apart the set and dismantled my little home-made studio (bedside lamps, green felt backdrop, double-sided tape, thumbtacks, etc) and said goodbye to Panda. It’s been a lot of fun, and I’ve enjoyed the challenge of making comics in a new way. 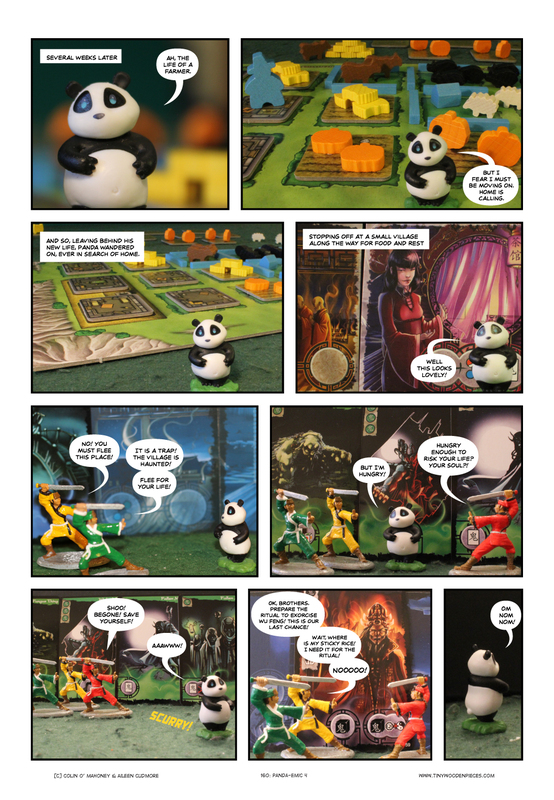 Panda wraps up his adventures next week, so I hope you join us then in seeing him off. In the meantime, we are hoping to finally get back to our Arkham Horror LCG campaign. We got our hands on the first two standalone expansions weeks ago, but still haven’t even finished the campaign from the base box. We’ve heard such good things about the expansions that at this stage I just want to get the base game done and move on. I will also be spending the next week preparing for Dublin Comic Con, which I will be attending as part of Turncoat Press. If you’re there, come say hi! I will also be looking for new clients to work with in my capacity as a freelance comic book editor. This is something I have been doing for a while now, and I have some free slots available in the coming months. So, if you are working on, developing, or looking to publish a comic, contact me through my website. I specialise in story editing, so if you are just looking for some script notes, edits, or guidance, let me know. 3 Comments on Panda-emic 4! It is a damnably difficult game alright. We love it, but we rarely win. Unrelated to last week’s comic…we finally got our hands on Sherlock Holmes Consulting Detective and are playing through and loving it. I was so intrigued after reading your comic on it (over a year ago I think) that I’ve been eyeing it ever since. So yeah, between that and X-wing thanks for helping us spend all of our extra money by introducing us to new games through your comics.